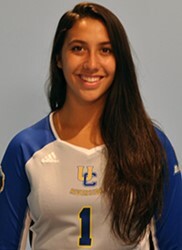 Riverside, California – Pilipa’a alum (2015) and current UC Riverside Senior Kaiulani Ahuna started her final season of college volleyball with a bang. The high-flying outside hitter set a UCR single-match kill record in a 3-1 (25-23, 21-25, 25-20, 25-16) win over the Montana Grizzlies in the first match of the Riverside-Fullerton Classic. Ahuna blasted 30 kills to eclipse the previous record of 29 set in 2012. Her record breaking kill came on match point and sealed the victory for her UCR Highlander team. She finished with 30 kills on 52 attempts and an amazing .462 hitting percentage for the match. Ahuna also added 14 digs to record her first “double-double” (kills/digs) performance of the year. Ahuna, who transferred to UCR from Eastern Washington, trained incredibly hard in the off season. She spent a significant amount of team in the weight room and in the gym including some court time our Pilipa’a girls. She begins the season very focused on leading her team through a challenging Big West season which includes a Sept. 29th match up against the University of Hawaii-Manoa at the Stan Sheriff arena. Ahuna and UCR will face Massachusetts-Lowell at 2:00 PM (11am HST)today before taking on her former team, Eastern Washington at 7:00 pm (4pm HST). Both matches will be streamed on BigWest.TV. Next Story → Ahuna sets record…again!